Health care providers who counsel patients about choosing a more healthful eating pattern are encouraged to consider personal, ethnic, and cultural preferences and use easy-to-understand language and food examples, according to a new scientific statement from the American Heart Association (AHA). "It's one thing for professionals to summarize the data and develop guidelines. An entirely different strategy is required to translate those guidelines into daily behaviors embraced in real life by real people," says Linda V. Van Horn, PhD, RD, a professor of preventive medicine (nutrition) at Northwestern University Feinberg School of Medicine in Chicago and chair of the writing group for the new scientific statement published in Circulation, an AHA journal. "To consumers, it's an apple, an orange, a pizza. It's not saturated fat, refined carbohydrates, and potassium. That's nutrition jargon familiar among professionals, but not normal conversation for the average American," Van Horn adds. 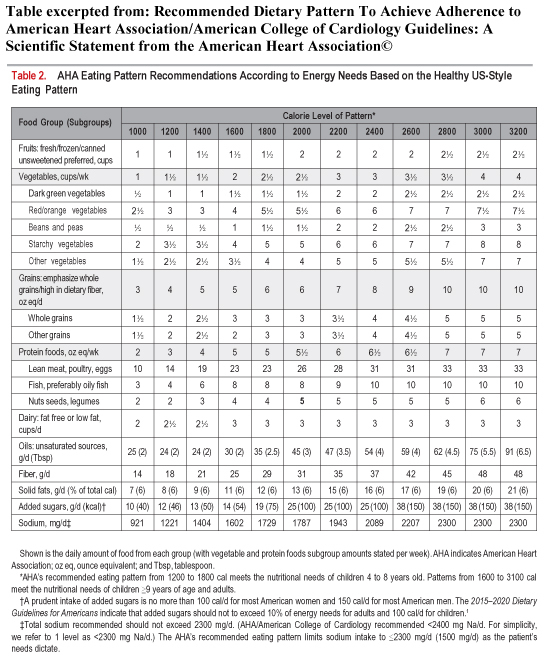 The statement spells out practicalities about following recommendations that the AHA and the American College of Cardiology (AHA/ACC) published online in November 2013 in Circulation, titled "2013 AHA/ACC Guideline on Lifestyle Management to Reduce Cardiovascular Risk," which emphasizes the importance of an overall healthful eating pattern. Americans of all ages are eating too little of some important nutrients and too much of detrimental ingredients that should be limited. While more than 80% of the US population eats less than the recommended amount of vegetables, about 70% of the population eats more saturated fat, sodium, and added sugars than is recommended. That's because the top three sources of calories in the United States are burgers, sandwiches, and tacos, followed by desserts, sweet snacks, and sugar-sweetened beverages, according to the most recent data from the National Health and Nutrition Examination Survey. A heart-healthy dietary pattern should include a variety of fruits and vegetables, whole grains, low-fat dairy products, skinless poultry, fish, nuts, beans, and nontropical vegetable oils and be limited in red or processed meat, sweets, and sugary drinks. 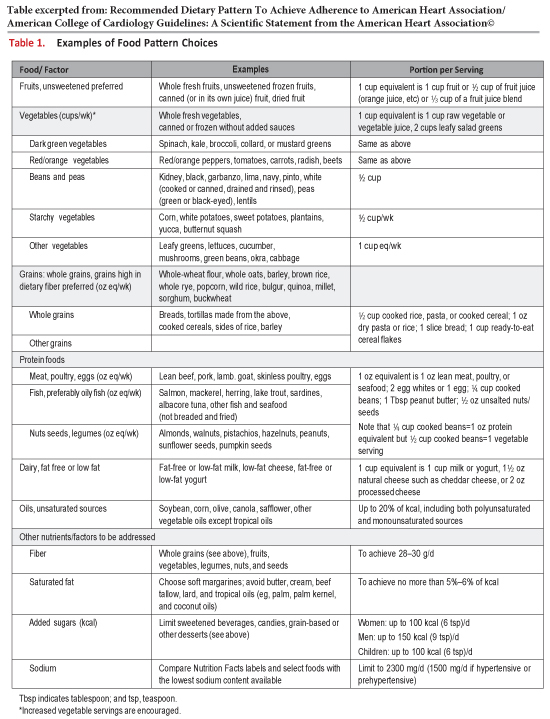 The dietary recommendations are broad-based and can be adapted to fit many different cultural and personal health preferences, as well as economic realities. "Identifying optimal nutrition for preserving good health is an ongoing, dynamic science," Van Horn says. "But there are fundamental principles we know now about how some foods decrease risk of heart disease, while other foods increase risk. For example, I've yet to see a study reporting that fruits and vegetables are bad for you." • Non-Hispanic black adults report lower intake of fruits, vegetables, and whole grains and higher amounts of sugar-sweetened beverages than non-Hispanic white adults. • The typical diet of people of Chinese, Korean, or Japanese heritage is lower in saturated fat but higher in sodium than typical US diets. • The typical dietary pattern for people of Asian Indian heritage is high in saturated and hydrogenated fats and refined carbohydrates. • American Indians and Pacific Islanders eat fewer fruits and vegetables than non-Hispanic whites. • Mexican-Americans eat more fiber-rich foods than other ethnic groups, but also struggle with obesity. Reasons for these differences vary and can include culture, tradition, neighborhood availability of more healthful foods, and price. However, when health care providers counsel patients about eating more healthfully, they should give strong consideration to helping patients find a more healthful way to eat that fits into their cultural and personal taste preferences as well as their economic circumstances. The statement offers providers a toolkit of practical, food-based suggestions to help people make more healthful choices and achieve a heart-healthy eating pattern. Portion sizes are listed for commonly purchased items, such as different types of vegetables, whole grains, meat, poultry, and eggs. "We translate the recommendations into real-life, buy-it-at-the-grocery-store, order-it-on-the-menu type choices," Van Horn says. "Counseling people about healthful eating is a process, but when someone becomes motivated to actually make dietary changes such as eating more fruits and vegetables, amazing things happen. In as little as three weeks, they develop a preference for those foods and even begin to miss them if they're not on the plate." Behavioral change is a key component of helping people eat more healthfully. The statement includes evidence-based approaches for motivating patients to choose well, plan for relapses, track what they eat, and gradually adopt a more physically active lifestyle to complement their healthful diet.